Unfortunately, these warnings came too late for Morgan Leslie Segal, who died in 1996 at the age of 29. For six years, she grappled with a condition that started as low self­-esteem and worsened into major depression. During this period, she was given a variety of SSRI and other medications. She stuck with a single therapeutic mode and her prescribed medications even though the combination seemed to just make her worse. Finally, in desperation, she attempted suicide. The second time she succeeded. HelpGuide was launched in 1999 by Morgan's parents, Robert and Jeanne Segal. It was inspired by their belief that Morgan’s tragedy could have been avoided if she had access to well­-written, professional information that gave her a sense of hope and direction. In the past 20 years, HelpGuide has grown from a small local project to an internationally­-recognized website that reaches tens of millions of people a year—all with no advertising of any kind. We are delighted by the size of our audience and by the correspondence and feedback we get. We hope this website benefits you and your family and friends. Leslie Segal was a middle child—the peacemaker. She was quiet and gentle, with compassion that encompassed anyone and anything that was troubled or hurting. In high school, she first found her voice as a writer for the school paper and yearbook staff. In her college years, she fell in love with the Spanish language and traveled to Washington, DC as an intern for the Latino Congressional Caucus. In her mid-­twenties, the life that was soaring began to falter. She changed her name to Morgan, "woman of the sea." She almost completed a graduate psychology program, but decided she preferred writing and left to attend Sarah Lawrence College. Later, she became a feature writer for the USC Daily Trojan and a literary magazine. Though Morgan continued to grow as a writer, she increasingly lost touch with herself and retreated from those who loved her. She died by suicide shortly after her 29th birthday. After Morgan's death, Robert and Jeanne found her laptop computer containing a collection of her personal poems and stories. 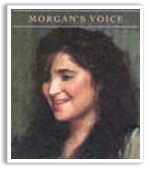 This led to the publication of Morgan's Voice. Click here to read the entire Los Angeles Times article by Al Martinez.